Author’s Note – With the Senate recently passing its version of HR 1 by a 51-49 vote it will begin reconciliation with the House to finalize the most significant tax reform in 31 years. Though this tax bill will expire on December 31, 2025 and reset to current law due to a budget gimmick necessary to comply with the Byrd Rule, it still will have long-lasting impact. It is important to meet with your tax advisor in the new year to discuss how to potential take advantage of the “flow through business “ – S Corps and partnerships—reduced tax rate to a little below 30% and a corporate tax rate reduced to 20%. Congratulations! You have been named a partner at your law firm, and you’ve earned it. I know, my attorney friends on track or current partners of your firms, you have sacrificed nights and weekends to bill 2,000-plus hours each year or canceled plans on a Friday night because your senior partner walked in your office at 6 p.m. and gave you an assignment with a Monday morning deadline. Becoming a partner can impact your financial plan today and in the future. The key to long-term financial success is converting a portion of this income growth into assets for the future. As your income increases, you have the opportunity to do two things: expand your lifestyle or save for financial independence (the point at which you work becomes discretionary). However, those with sound financial plans do both. After dedicating so much of your life to your law firm, the last thing on your mind is knowing what’s behind the partnership curtain and what to expect when you get there—if you want to get there at all. Whenever I ask my law partner clients about the firm’s terms of their partnership, I tend to get nothing more than incoherent rambling or a blank stare. As a starting point, I would advise all partners to become educated and review the partnership agreement to understand what it says about governance, structure, operations, and management. Additionally, you should review any policies or processes that may apply to important topics, such as partner compensation. Finally, you should have an understanding of what input you have as a partner into the policies and decisions the firm may make (e.g., under the partnership agreement, what matters are subject to a partnership vote?). 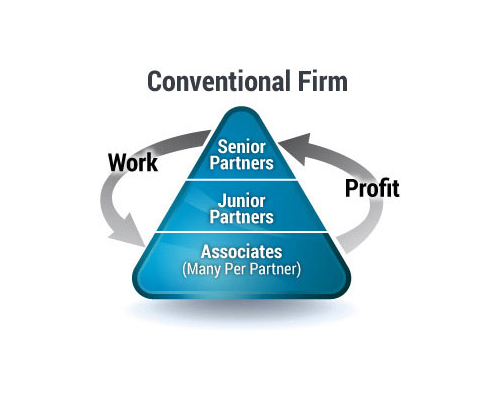 There are two primary law firm partnership models: single-tier partnerships and two-tier partnerships. Up until the 1990s, almost all law firms had single-tier partnerships. While associates are paid salaries and performance bonuses, partners in this model are given an equity interest in the partnership, hence the term “equity partner.” As an “owner” of the firm, a partner’s compensation is tied to the firm’s revenues or their own contributions to that revenue. Equity partners don’t necessarily take salaries (though they sometimes do); rather, they receive a “draw,” usually paid monthly or quarterly. Most often, the partner’s draw is a percentage of the firm’s profits for a given period of time. The amount of a given partner’s percentage, which may be determined by all of the partners (in smaller firms) or a compensation committee (in larger firms), may be based on the partner’s performance and contributions over the last year or two, including such elements as billable and non-billable time, billings, collections, accounts receivable, write-offs and write-downs of bills, and disbursements. Draws for equity partner can be calculated in other ways as well. “Eat what you kill” is shorthand for basing compensation on the amount of the partner’s production (i.e., how much work this partner brought in to the firm). Firms may also adopt a “lockstep” compensation system in which the amount of a draw correlates with the partner’s seniority. Of course, as with any business, law firms need capital to operate. Sometimes, that capital comes from the owners of the business. Equity partners may be called upon to make capital contributions to the firm when necessary. Today, due to changes in the way firms hire attorneys and as lateral hires have become more common, the Two-tier partnership has become the dominant law firm partnership model. Either an outstanding senior associate is elevated to partner or a lateral hire is brought on as a partner, but they are “non-equity” or “income” partners (or as some lawyers say, “glorified associates”). Non-equity partners may have some say in firm governance and administration, but they do not get an ownership interest in the firm like equity partners have. Compensation for non-equity partners usually remains a salary largely based on the same factors that determine the amount of compensation for associates. Will I be receiving a draw only or is there also fixed compensation? Is the law firm an LLP (most firms are) or an LLC? LLPs and LLCs vary significantly in terms of operations and structure. How is the amount of each partner’s draw determined and how often do partners receive their draws? How much in capital contributions will I be required to make and when will I be required to make them? How will partnership impact my benefits and how much will I pay for those benefits? If the firm’s structure is a two-tiered one, what are the criteria for becoming an equity partner after I am made an income partner? You will generally be required to make capital contributions to the firm. Your personal tax return will become much more complicated as an equity partner. You will receive access to a better package of employee benefits, but you will need to pay for them yourself. You become an owner in the law firm business, with all of the related benefits and risks. You will need to revisit your overall financial plan to consider asset location and estate planning. Note: This applies to equity partnership. Contract/Non-equity partners experience significant changes as well, but those are not addressed in this summary. When you become a partner, you actually purchase a partnership in the firm. Said another way, you now need to buy an interest in your firm. Initial contributions can be costly and vary based on the firm you are joining. We say “initial contributions” because you may have an opportunity to make additional capital contributions to purchase additional shares of the partnership in the future . Or, in the unfortunate circumstances when your firm underperforms, you may be required to make contributions to fund a shortfall in the firm’s cash flow. According to Altman Weil, who advises firms on compensation and capital structure, capital contributions generally range from 15% to 30% of a partner’s annual profits and as high as 30%-40%. Partners in Am Law 100 firms could be asked to contribute up to $400,000 in capital, with partners at Am Law 200 firms putting in around $200,000. Most firms give new partners some time (2-3 years) to pay the initial capital contribution, either through a lump-sum payment (if you have the cash on hand), deducted from monthly draw/year-end bonus, or through financing. Often a firm has a banking relationship that offers terms to finance your capital contributions (secured by the firm’s accounts receivables) over five or seven years, with interest. These capital loans will usually require substantial monthly or quarterly payments. If you own a home with equity, you can use a home equity line of credit or a cash-out refinance to make your initial contribution. Make sure to contact your lender for a mortgage analysis 6-12 months before actually needing the funds. There are several ways to make this contribution, and it is important to find the method that best suits your personal circumstances. You get your capital contribution back when you leave (often with five years of departure). The partnership agreement will address the terms governing eligibility for and repayment of capital. When a firm fails the partners generally lose their capital contribution, so new owners need to make sure that they understand their firm’s financial standing and prospects for the future. Those attorneys moving from W-2 employee to K-1 owner need to make sure to allocate sufficient cash flow to cover their quarterly taxes. In addition to your normal federal and state taxes, you may pay a self-employment tax (15.3%) that covers your annual contribution to Social Security and Medicare. Don’t forget about the 0.9% Medicare tax imposed above certain thresholds, as implemented by the Affordable Care Act in 2013. Until you become a full equity partner in your firm, paying estimated taxes is fairly straightforward. If you are a guaranteed payment partner, your taxable income is earned and paid ratably throughout the year and without regard to the profitability of your firm. That means you can likely make equal payments each quarter based on your estimated taxable income for the year. This assumes a non-working spouse. When you become a full-equity partner, however, you need to pay taxes based on the taxable earnings of the firm by quarter—which can be uneven throughout the year. Law firms generally provide the partners with data per quarter to calculate the varying estimated payments. If you are a full-equity partner and your accountant has you paying equal estimated payments throughout the year without regard to your firm’s actual earnings, you may be overpaying the IRS early in the year—and putting a strain on your cash flow as a result. Any partner who is a full equity partner should be annualizing their estimated tax payments. Earnings are likely driving their cash distributions, so they don’t generally want to make a larger payment than necessary in any quarter. The best practice, therefore, is to work closely with your tax advisor and your firm’s internal accountants to synch your estimated payments to your actual quarterly earnings. Some CPAs don’t want to calculate annualized tax payments and just use the safe harbor, which most often results in overpayments, but some partners prefer a steady and conservative approach. The safe harbor is calculated to avoid underpayment penalties. Most partners miss some low-hanging allowable deductions. For example, failing to deduct the interest paid on a capital account loan, which is money borrowed to make a capital contribution. Unlike itemized deductions, which are detailed on Schedule A of your tax return, the interest is deducted on Schedule E to directly offset your partnership income. Business expenses which your firm will not reimburse you for (such as certain cell phone expenses or business gifts up to $25 per person) are also deducted on Schedule E. Another significant deduction, though rarely missed, is health insurance premiums paid by the partner, including dental and an allowable portion of long-term care (depending on your age). This is known as the “Self-Employed (S/E) Health” deduction. S/E Health is deducted 100% on page one Form 1040, and not as an itemized medical deduction. The change in their tax situation that most surprises new law firm partners is realizing that they need to pay taxes in every state that the firm does business in. The good news is that you can elect into “composite” state tax returns to eliminate the need for many state filings. A general rule of thumb is to elect out of composite returns in high tax states. In this case, it makes more sense for partners to file individual tax returns in those states. California and New York have high state tax rates, and in most instances, the partner will do materially better to elect out of these state composites. You should also ask your tax advisor about any reciprocal agreements between your home state and the potential composite states, which could make filing an individual non-resident state tax return the better choice. Partners also need to make choices regarding making estimated withholding payments to states. One option can be to have the firm make those payments on the partner’s behalf. This eliminates the need for partners to make their own estimated payments. Watch the rate of the withholdings, as the payments are often too high and result in material year-end refunds. Partners need to decide whether it makes sense to intentionally overpay a state and then wait for the refund. Many law firm partners participate in both defined contribution and defined benefit plans allowing for significant pre-tax retirement plan savings and accumulation. In 2017, most law firm partners are eligible to contribute up to $54,000 ($60,000 for individuals age 50 and up) to their firm’s qualified plans. If your firm offers a cash balance plan, your eligible contribution could be well above $100,000. Usually, every dollar contributed is tax deductible, so the after-tax cost could be as little as 50% of the total contribution. Usually, a partner will pay for all such benefits; in contrast, as a non-partner lawyer, the lawyer is an employee, and the firm will be paying for part of the benefits (note that this answer also will vary significantly depending upon whether the firm is an LLP or LLC). Firms often will require partners to carry certain levels of insurance and also to participate in certain retirement programs, and it is important to understand any such provisions. Some firms also offer a non-qualified retirement benefit to partners. These plans provide supplemental retirement benefits in excess of the qualified plan benefits. Many firms have either frozen or eliminated these types of plans; however, some still exist. Something to be aware of here is that non-qualified plan assets are subject to the claims of firm creditors. Budget – Your priority at this point in your career is to build your balance sheet and increase your liquid assets. Develop a detailed budget, stick to it, and use it as the foundation for building your personal and retirement accounts. As I mentioned earlier, your income could very well become much more sporadic throughout the year, with lower monthly draws and periodic larger profit distributions. You need to make sure that you have considered this in your monthly and annual budgeting, and also have lines of credit available in case you need help getting through the lean months between distributions. Cash Flows – Don’t overlook your firm’s “financial health and overall well-being” and how it may or may not impact you. You must have a good reading on your firm’s capital obligations and how you are or will be funding those obligations, and on your profit sharing prospects. Partners will be required to pay the full cost of benefits such as medical insurance and pension contributions, which will be a deduction on tax forms. There are many variations of profit sharing and equity compensation plans, e.g., lockstep, seniority or incentive-based, and objective or team based. Each of these and other variants has its strengths and weaknesses. Understand your options and discuss the related implications with your investment advisor. Asset Allocation – More generally, take a conservative, diversified approach to your financial portfolio and the allocation of the assets it compromises, and make certain the allocation reflects your unique requirements and your short and long-term objectives. As a rule, invest in liquid securities, and invest only in those strategies you understand. Should you plan to invest in anything other than traditional stocks, real estate, and bonds, make certain both you and your financial advisor have agreed there is a compelling reason for investing in an alternative strategy or one with lower levels of liquidity. When considering how much fixed income is appropriate within your allocation, don’t lose sight of your firm’s capital since it functions like a zero-coupon bond highly concentrated in a single issuer, aka your firm. Insurance – Long-term disability benefits are likely to increase significantly. However, unlike medical insurance, the premiums are not deductible. That being said, because partners are responsible for the premiums, any LTD is income tax-free. Firm-sponsored partner life insurance may be either group term life insurance or some form of group universal life insurance. The amount of coverage can be significantly higher than coverage for associates, and in some cases, it can be as high as $1 million, $2 million, or more. Group universal life policies have two advantages over group term life. First, if you leave the firm, it is portable at the same rates available to the firm. Second, you have the option of putting additional cash into the policy to accumulate income tax-deferred cash value, making it possible to afford the coverage when you retire from the firm. Estate Planning – It’s extremely important to understand that your estate plan serves as the foundation for your financial plan. In the event you have not already addressed such basic estate planning issues as your will, health care proxy, living will, power of attorney, and trusts, you will need to do so now. Estate tax is becoming less of an issue compared to income tax planning for attorneys. But there are trust-planning strategies that might reduce any potential tax burden or be of relevance in administering your tax situation more efficiently. Tax Planning – Partners of law firms with international operations can pay significant taxes to foreign countries. There are various strategies available to optimize the benefit of these foreign taxes on your U.S. return. Discuss with your tax advisor whether a foreign tax credit or foreign tax deduction would be more beneficial and whether any prior year returns should be amended to optimize your taxes (there is a special 10-year look-back period that may apply). Don’t forget about taxes when achieving firm milestones or changing law firms. Key firm events such as mergers, sales, and bankruptcies as well as changing law firms, can have a significant impact on your tax bill. Be sure to discuss these events with your tax advisor in advance to ensure you fully understand the tax implications and have time to plan appropriately. Bear Market Strategy – In light of current and anticipated market conditions, your fixed income portfolio should be designed to act as risk management & diversification, optionality to tactically rebalance into depressed assets, and provide liquidity when equities are in a correction. I generally recommend 3-7 years of annual required cashflow in bonds. If you annually need $120k from your portfolio to expense your lifestyle, you would want $360k-$840k in short-term fixed income that matches inflation. Hire a Financial Advisor – To carefully define your liquidity and cash flow requirements, construct targeted return expectations for your portfolio, and build an asset allocation customized to your unique objectives. Be sure to establish periodic reviews to assess your allocation and performance and to make necessary changes as market and economic conditions dictate. Most partners simply do not have time to deal with all of the wealth management issues. That is why it has never been more important to your future to align yourself with a financial adviser who has only your best interest in mind. In other words, do not take advice from anyone who has a vested interest in the product(s) they are recommending. You will be relentlessly targeted by individuals aggressively selling insurance products. Too often, decisions regarding these products are made without a real understanding of the associated needs, costs, and risks. In summary, I’ve mentioned several times that your financial life gets a lot more complicated once you make equity partner in your firm. If you are an attorney and your financial advisor is not providing you with the insight, clarity, and partnership highlighted above, then give us a call and schedule your free consult. This article contains general legal and tax information and does not contain legal and tax advice. Lionshare Partners is not a law or tax firm or a substitute for a tax attorney or law firm. The law is complex and changes often. For legal or tax advice, please ask a tax lawyer.